Our philosophy of being a patient-friendly practice in a stylish ambience covering more than 350 square meters of barrier-free floor space forms the basis for stress-free and relaxing treatment. We take extra time for the preliminary personal discussion and individual consultation. Our White Conference Room, an accessible ‘tooth in a room’, provides the best technical conditions for optimum and successful clarification. We roll out the red carpet for you – as our guest you will enjoy outstanding service and many advantages, because everything we do is directed towards the well-being of the patient. 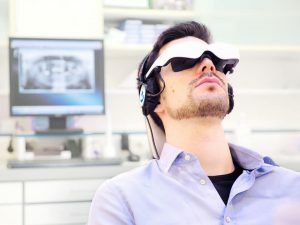 We would like to make your visit to our practice as pleasant as possible with special extras, such as our video glasses: with HappyMed video glasses patients can watch movies during dental treatments and are thus better distracted and experience less stress and anxiety. The reduced level of stress and anxiety allows us to optimize the medical procedures. The system is guaranteed to be easily manageable in a medical environment and is currently being used in hospitals and dental practices. We have a large range of documentaries, comedies, children’s films and feature films, concerts, as well as relaxation and action videos available to provide a suitable distraction for every patient. HappyMed can be controlled during the treatment using its integrated touchscreen, or via the intuitively operable remote control. All films are licensed for use in our practice. Immerse yourself in far-off worlds during your treatment and enjoy exciting blockbusters or relaxing films. You will see: the time in the treatment chair will pass in a flash.